Damaged apples after Friday's hail storm. Last Friday’s hail storm left some fruit growers with severely damaged trees. Apples and cherries took a beating in parts of Leelanau and Antrim counties. Nikki Rothwell, coordinator at Northwest Michigan Horticulture Research Center, visited orchards on Monday to assess the damage. "The hail damage really made a lot of marks on the apples," Rothwell says. "So there’s a lot of bruising, but then I do see some areas where the flesh is actually torn." Honeycrisp and Sweet Tango apples took a hit at Cherry Bay Orchards in Suttons Bay, says Francis Otto, the orchard production manager. "My high value, fresh market apples are just a total loss," says Otto. "We’ll probably go through and actually pick the apples off now to try and let the tree regenerate." He says they’ll leave the apples on the ground and hope for a better crop next year. About 350 acres of tart cherries were also severely damaged, Otto says. He says these losses won’t just cost Cherry Bay Orchards money, it will cost harvesters jobs. Nikki Rothwell says growers won't sell damaged apples and cherries as fresh produce anymore, but they could possibly sell them to juicers or processors for less money. Other growers, like Otto, might abandon ruined crops. Rothwell says they don’t yet know the full extent of damage across the region. Growers in Manistee and Benzie Counties and on the Old Mission Peninsula did not get hit. Spring came early in Michigan three years ago — very early — and fruit crops were later wiped out by frost. That has some researchers in Lansing asking if there's a way to delay the spring bloom in a warm year. It's no secret what cause a cherry or apple blossom to come out in the spring — warmth. So if you want to slow down that process you just spray cold water on the tree. While we were begging for winter to end, the Michigan Apple Committee was happy for the cold temperatures. 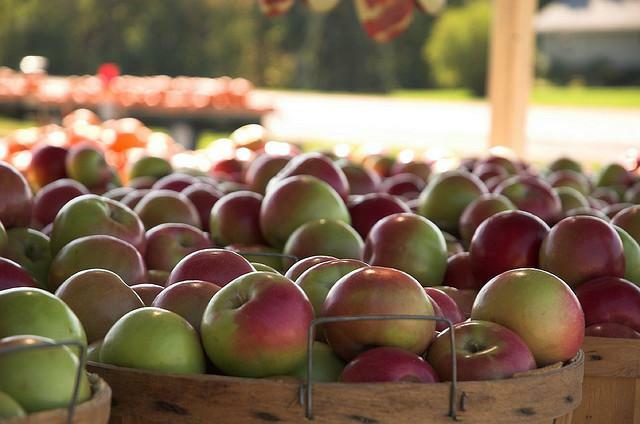 As a result, the 2014 Michigan apple crop is expected to be 28.74 million bushels. That’s about 435 million apple pies. Diane Smith, executive Director of the Michigan Apple Committee, said that apple trees like the cold winter. The past lengthy winter allowed for the trees to stay dormant, and not wake too early before the spring. “The apples look beautiful, there aren't any issues, and everything’s coming along the right way,” Said Smith. *Listen to the full interview with Diane Smith above. A legal dispute between an Elk Rapids food processor and the U.S. Department of Agriculture is headed back to court. Burnette Foods filed the lawsuit in 2012, claiming an administrative board that controls the cherry industry is antiquated. Owner Bill Sherman says the cherry board has had a negative effect on his business. “We have huge amounts of imports coming into the U.S. of tart cherry products and at the same time, we are not allowed to sell our products under the threat of severe financial penalties," says Sherman.